I feel that you need to be prepared properly to enjoy Blood And Rain, the latest offering from the up-and-coming Glenn Rolfe. 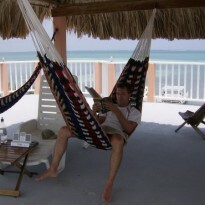 Glenn is yet another author from Maine to throw his hat into the horror genre ring. Now before you Stephen King purists out there yawn and let out a "Ho Hum", you need to check your ego at the door. While the state of Maine has given us horror addicts King, Ketchum and others, Rolfe proves that there must be something in the New England water that breeds creativity. 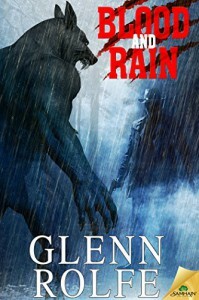 Blood And Rain is a werewolf tale that is how werewolf tales are meant to be told. Fast, furious, and balls to the wall. Gilson Creek, Maine is that kind of small town that we all know and love. Its familiar and comfortable, like we've been there before, maybe even lived someplace like it ourselves. It's slow paced, blue-collar and everyone knows each other. But not all has come up roses in this idyllic town's past. In 1997, a set of killings during a full moon cycle caused the residents to check their calendars and lock their doors everytime the moon is full. The sheriff at the time proclaimed it was from a wild animal attack, probably a mountain lion, even though a mountain lion hadn't been witnessed in those parts since 1936. Soon afterwards, he resigned as sheriff and promptly checked hiimself into a mental hospital amidst a breakdown. The deputy at the time, Joe Fischer, is now the new sheriff and a new batch of killings has started up again after all these years and wouldn't you know it - the moon happened to be full. Gilson Creek isn't unlike any other small town. They all have their secrets. But for Gilson Creek, their secret is back and its spilling blood. A lot of it. Blood And Rain is not Charles Dickens. But Blood And Rain is a wild midnight ride with the lights off, your hair on fire, and the music cranked to 11 and should be viewed as such. Rolfe is new and it shows. This story has some warts - the pacing can be off a touch, you'll change POV without warning, but this book is fun. A real page turner. I flew though it at breakneck speed and its been a while since a book has captured me like this one. The blood is spilled by the gallons and the carnage is brutal. Rolfe's werewolves enjoy ripping limbs off. I've seen blurbs that compare him to Stephen King and Richard Laymon. I'd have to agree and disagree. Rolfe tells a tale that captures your attention like King without all of the wordiness. He also spills the red stuff like Laymon without the rediculous silly characters and dialogue. As you can probably tell, I'm now a fan. I think you will be too. I received an e-copy of this book in return for an honest review.